WITH TWO weeks of data we can make some assumptions about which players may go on with their early-season form. Hitting up the player pool in AFL Fantasy Draft is imperative for success. Coaches who successfully claim free agents available can add depth to their side or right some of the wrongs from draft day during the pre-season. As you recruit a free agent, be realistic with your expectations from them. Do the maths on your league. If you have four starting midfielders and every coach has at least one on the bench, that means in a 10-team league there are 50 midfielders in squads. Last season the 50th ranked midfielder averaged 89 points. Most Draft leagues opt for restricted free agents (RFAs) as part of their settings so that it isn't 'first in, best dressed'. Consider enabling RFAs it as a fair way to pick up players available each week. The preferred setting has a one-day time period to get bids in and the lowest on the ladder gets first choice. The first few rounds are the busiest for free agent pickups, so we have another bumper edition full of players who may be available in your league. Generally they will be owned by fewer than 70 per cent of teams competition wide, but with a variety of league sizes and settings, you'll need to check your player pool. A defender coming off the bench who averages in the mid-80s? Yes please! Worthy of a starting spot as long as he is able to maintain around 20 disposals per game and take half-a-dozen marks. The Power have changed their gameplan which has seen an increase in disposals. DBJ was one of seven players to ton up against the Blues thanks to 27 touches. He may even get a bit of a bump with Jack Watts injured. During the pre-season we were all over looking for players who were taking the kick-in due to the new rules. The Bombers have had plenty of scores kicked on them thus far and Saad's pace was used a few times across the first two rounds, taking advantage of being able to leave the goalsquare without having to kick to himself for the bonus Fantasy points. Playing roles on Richmond's midfielders in his first game of the season, picking any defender who is around the ball has to be considered. In a deeper Draft league, stash him on the bench and play whenever the Pies are up against teams where plenty of points are given up to midfielders. He was mentioned in this column last week and the few coaches who jumped on would have been stoked with his 129. I'll keep this simple, just grab him! Harmes finished last season averaging 103 in his final eight games. Scores of 91 and 94 have been solid and certainly rosterable in Fantasy Draft. However, it is his upcoming draw against the Bombers, Swans, Saints and Tigers that is exciting. All teams give up plenty of points and surely the Demons only get better. Injury limited his output in round one and a large number of leagues saw him dropped to the free agents ahead of round two. The new co-captain of the Suns should be in every squad and provided he stays fit, will nudge a mid-90 average as he had done previously. Taking 13 marks definitely boosted Roughead's return as the Pies racked up a ridiculous number of uncontested marks and also ranked third for team Fantasy points for since 1999. While this won't happen every week, the dual-position flexibility will be handy to plug and play when needed. If he is still available in your league, pick him. His first two scores of 90 and 102 is more than we can expect, but last year the 30th ranked forward averaged 80; a mark that Newnes is likely to push. Nine tackles were a big factor in Parfitt's round two score of 93, backing up from 84 in round one. Natural progression should see the third-year Cat increase on the four tons posted last season to be one of the forwards who outperform their ADP. Many coaches have been waiting for Gresham's Fantasy breakout. On Saturday afternoon he played plenty of minutes in the midfield, racking up 25 disposals and kicking two goals for 98 points. It is the St Kilda show here as we're looking for free agents available as forwards, but there is good reason for Marshall to appear after coming in for his first game of the season. Lewis Pierce was dropped and the 23-year-old took the mantle as the club's No.1 ruck. 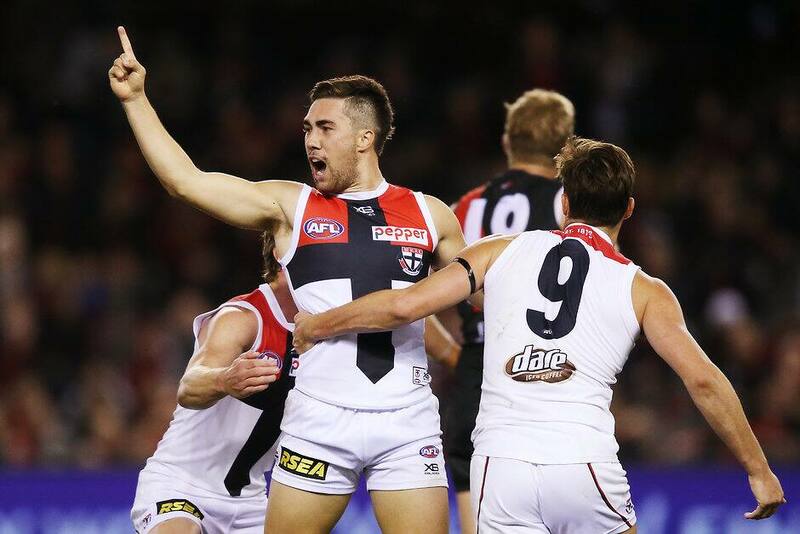 While the Saints were soundly beaten by the Bombers with hitouts (53 to 24, Marshall managing 21), he was able to lay eight tackles to go with his 15 disposals and 103 Fantasy points. Marshall may add RUC status in round six.